GORTON, a township and a chapelry in Manchester parish, Lancashire. The township lies on the Manchester and Sheffield railway, and on the Stockport canal, 3 miles ESE of Manchester; and has a station on the railway, and a post office under Manchester. Acres, 1,429. Real property, £23,030; of which £332 are in gas-works. Pop. in 1851, 4,476; in 1861, 9,897. Houses, 1,813. The increase of pop. arose from the establishment of railway works, and the erection of a cotton mill. There are hat manufactories, chemical works, gum-works, a tan-yard, and a stained paper manufactory. A city gaol of Manchester was erected here in 1856; and a zoological garden is maintained in connexion with the Bellevue inn. The railway here passes 20 feet under the canal. There is a reservoir, of upwards of 70 acres, belonging to the Manchester water-works. The chapelry was constituted in 1854, and curtailed in 1865. Pop. in 1861, 7,017; in 1866, 2,490. The living is a rectory in the diocese of Manchester. Value, £150. Patrons, the Dean and Chapter of Manchester. The church is a brick edifice in the Doric style. There are places of worship for Independents, Baptists, Wesleyans, and Unitarians, a national school, and an excellent boarding school. Local studies information is held at Manchester central library. Details about the census records, and indexes for Gorton. You can also perform a more selective search for churches in the Gorton area or see them printed on a map. The Register Office covering the Gorton area is Manchester. Ask for a calculation of the distance from Gorton to another place. "GORTON, a chapelry in the parish of Manchester, hundred of Salford, county Lancaster, 3 miles S.E. of Manchester, its post town on the main road between Manchester and Mottram. There are stations on the Manchester, Sheffield, and Lincolnshire, and London and North-Western railways, and the Stockport canal passes by it. In the village, which is of considerable size, are cotton-mills. A large number of the people are employed in the manufacture of hats. There are also works for railway carriages, boilers, chemicals, stained paper, and tanning. One of the reservoirs for the supply of Manchester, above 44 acres in extent, is situated in the Vale of Gorton. The living is a rectory in the parish and diocese of Manchester, value £150, in the patronage of the Dean and Chapter of Manchester. The church is a modern brick building, erected on the site of a former one, dedicated to St. James. The church is a modern brick building erected on the site of a former one, dedicated to St. James. There are some small charities. The Baptists, Independents, Wesleyans, and Unitarians have places of worship, and there is a National school." In 1835 Gorton was a township in the parish of Manchester. Information about boundaries and administrative areas is available from A Vision of Britain through time. 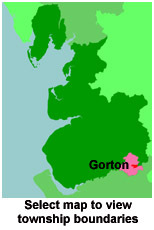 You can see the administrative areas in which Gorton has been placed at times in the past. Select one to see a link to a map of that particular area. A description of Gorton in the 19th century. View maps of Gorton and places within its boundaries. Crossley Brothers built cars in Gorton. For probate purposes prior to 1858, Gorton was in the Archdeaconry of Chester, in the Diocese of Chester. The original Lancashire wills for the Archdeaconry of Chester are held at the Lancashire Record Office.